· Have a set time for dinner- Most families find eating between 4:30 and 5:30 is best for toddlers, eating any later will just push back their bed time. · Begin winding down your toddler’s day after meal time- After dinner try and get your kid to do activities that won’t get them wound up, like reading or board games. · Have a set time for bed- A toddler should be in bed between 7 and 7:30pm. It is also important to let your child know when bed time is approaching. · Make bath time part of your bedtime routine- Warm baths can help your child relax and once it is a part their routine it will signal to their body that it is bed time. · Avoid foods that tend to energize your child before bed- Anything with sugar is definitely a bad idea before bedtime, as are drinks an hour or less before they go to sleep. · Have your child pick out his or her pajamas- Allowing your child to have a say in what they sleep in gives them the feeling that they share control over the bedtime routine. This can help avoid other bedtime battles. · Make good night, good night- Avoid prolonged farewells and returning to your child’s room for just one more kiss or hug. This gives your child a false sense of hope that bedtime can be bumped back. By following these tips or creating your own bed time routine for your toddler their bedtime can become much less of a challenge. 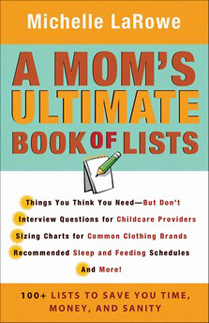 For more helpful parenting tips check out Michelle LaRowe’s book “A Mom’s Ultimate Book of Lists.” Send us your child’s bedtime routine; write to us at editor@excitingread.com.